Yair is fantastic. His work is impeccable and completed with great attention to detail. He is entirely trustworthy on every level. It was a pleasure to have him around the house. Panoramic hand painted panaramic mural wallpaper. The installation looks wonderful. I am very happy to have found you when this project first began. I would be happy to write a letter of recommendation for you. Should it simply be in the form of a letter to you, indicating my satisfaction with the project? All looks amazing! Thank you so much for your hard work!! Happy new year! Yair is the best wallpaper hanger I have ever come across. I have not been back from holiday long, and did not have a chance to look at the screens properly before now, but I must say they look brilliant - particularly the fabric side which I would imagine is incredibly difficult to do. Thank you very much ! He has done a fine job for me in my showroom. Thanks for doing such a careful job in my house. We undertook a complex project involving a collage of three layered panoramic vintage Sanderson wallpapers, for a room set, to be photographed for my book called 'Glorious Interiors'. 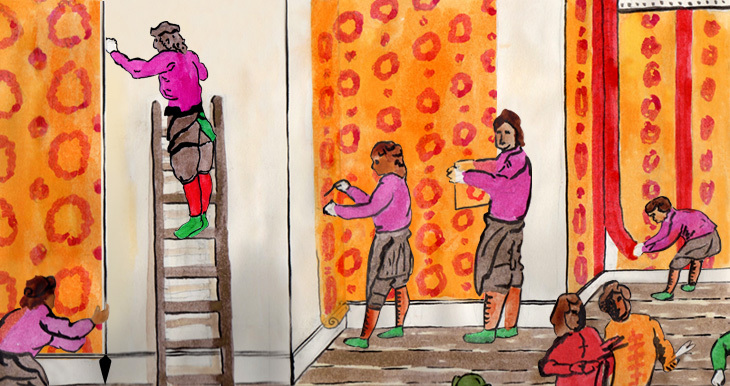 Yair completed the work to a very high standard and would recommend him for wallpaper hanging. Yair is in a different league to any craftsman I've ever come across. He is completely thorough, his preparation is impeccable (he made our wall look amazing before he'd even hung the lining paper) and the end results were superb. On top of this he's neat, discreet and a joy to have around the house. Thank you for a great job, it looks very good. Sol Goodall, Olive Maintenance Co. for The Wolsley Restaurant, London. Thanks for the job. Looks very good. Tim Preston, client for Partridge & Green Panoramic hand painted panaramic mural wallpaper. Hi..I am sitting in my hotel room post the Florence Broadhurst - Madame Jo Jo's party in London. Regarding Florence's wallpapers, Signature Prints can supply the wallpapers both trimmed and untrimmed. If you are looking for a great hanger we have been working with a company called Wallpaper Hangers who are awesome. Yair can be contacted at ymeshoulam@aol.com. Check out Madame Jo Jos (8-10 Brewer Street, Soho) to see Florence designs that have not been released as wallpapers before. French Fountain, Butterflies and Exotic Birds. You cant miss it because we have hung wallpaper on the outside of the building! Enjoy...from Helen Lennie Signature Prints - Sydney - Australia. Helen Lennie signature prints exclusive printers of Florence Broadhurst wallpaper. Thanks for doing such a lovely job in my bathroom - it looks stunning ! The wallpaper looks fantastic and the client is thrilled so thank you very much.